Well, it’s official: field season 2010 has come to an end. Our teams did an incredible job traversing the eastern regions of northern Canada, working in 8 communities in 5 provinces and territories. A mind-boggling number of specimens have been collected, along with important environmental data. Now the real work begins! Before we talk about the next stage of the project, some of our team members have provided some snapshots of their final days in the North. I think it’s safe to say this summer was one that won’t soon be forgotten. 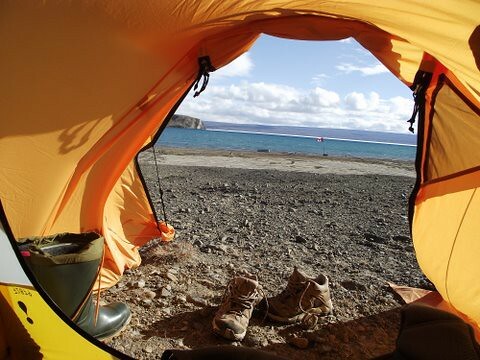 Hazen is a dream for anyone who likes to be isolated in a tent on an amazing site; Hazen was a dream for me. I felt so lucky every second I was there even after a few days of work because to work in Arctic is a great opportunity! This ecosystem is breathtaking. It felt like a privilege to see it. Ellesmere Island is almost the size of Great Britain but with only one thousand people on it I would say (because of military bases). It was exactly what I needed : free space for my free time. I spent all my free time hiking around. My best hike was with PhD students I met on the camp. We left the camp at 10 pm. We followed Skeleton Creek and climbed the crete on the hill between Blister Hill and McGill Mountain. It was perfect! Funny to hike at night time. McGill Mountain was a challenge, probably the most difficult mountain I climbed. There was no trail but so many rocks. Every step you make, you fall half a step because of rolling stones. Meagan was amazing. We call her “the mountain goat”. She was so fast; she arrived 45 minutes before us! On the top, there was a box with a journal to put your name and your comment. And surpris: a student from Alberta put a bubble bottle to make bubbles on the top of the mountain ! What a great idea 🙂 and what a view. It was the only place where I saw both extremities of the giant lake. Bigger than what I imagined before going. And the other side was spectacular too, a lot of mountain with glaciers. It was too cold (around zero) to stay on the top…but I kept a picture of the view in my head. What I did in Arctic was unforgettable: meet people with incredible background, hike and drink water from glaciers and see mystic animals like muskox and arctic wolves. When you go once, you just want to go back to see more. The final stretch in Iqaluit was amazing. The weather really picked up after Chris left, and we had some warm days at 22oC. This was approaching the historical high temperatures of 23oC for Iqaluit. 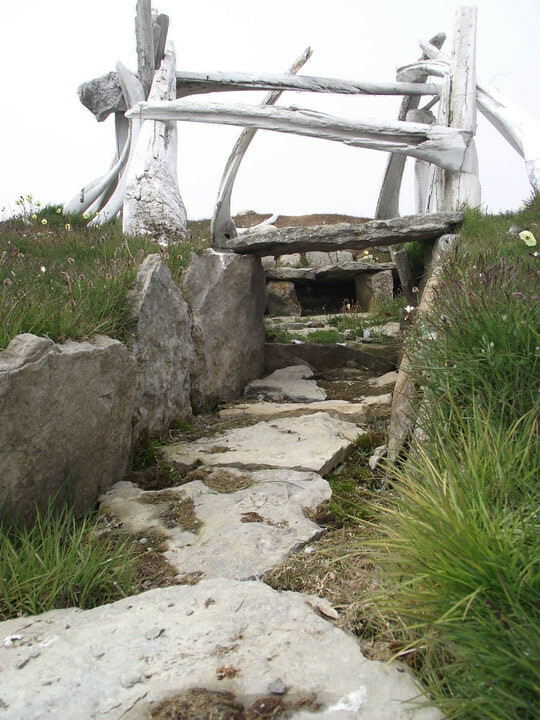 These days were spent going on long hikes doing opportunistic collecting, and finding snow patches for photo ops. One of the more interesting finds was another hornet’s nest inside a Caribou skull! Unfortunately, the last few days were quite a bit colder. Since I study biting flies, I was probably the only one upset by the lack of mosquitoes on those days. Overall, I found the summer temperatures to be more agreeable up north than those of my home town of Toronto, where the temperatures will get to the high thirties and low forties with 100% humidity. We spend these last few days taking in out terrestrial traps, sampling for aquatic insects and making ready for our departure. 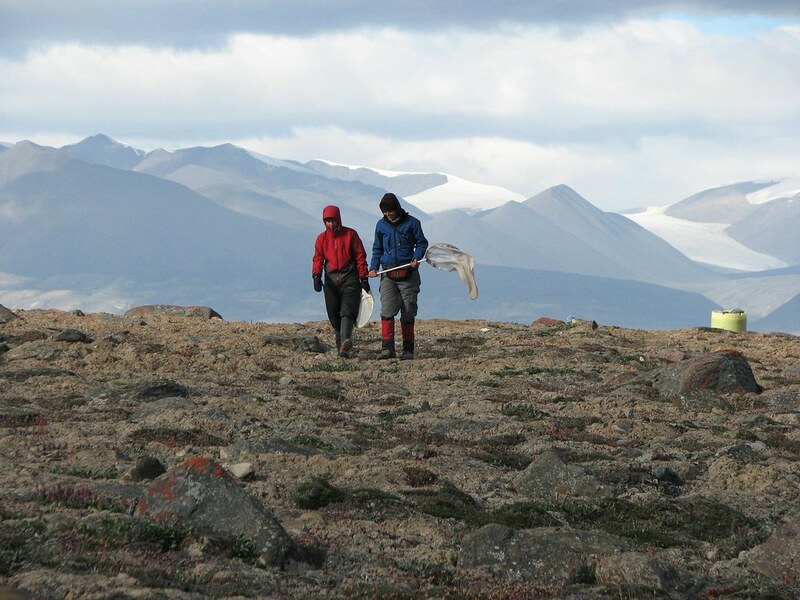 We are very grateful to Jamal Shirley, from the Nunavut Arctic College for all his help and for kindly agreeing to run a malaise trap for us throughout the rest of the summer. This will allow us to get an idea of any seasonal changes in the insect community that we might have missed as the summer comes on an end in the north. 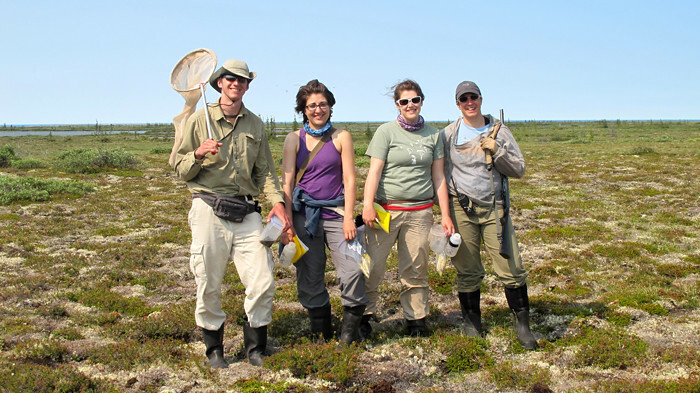 We also prepared a small collection of local beetles, wasps and butterflies for the Nunavut Arctic College. These specimens were collected by children participating in a summer science camp and they had a great time in the process! Luckily our departure from the north and arrival at our various home universities went smoothly. I am looking forward to examining the insects we found this year, and next year’s field season. Lake Hazen is known to be an “arctic oasis” that is considerably warmer and lusher than many other arctic localities located much further south, and while we were there we experienced highly variable weather… everything from near freezing and 30 knot winds to calm and beautiful days in the high teens and low 20s. 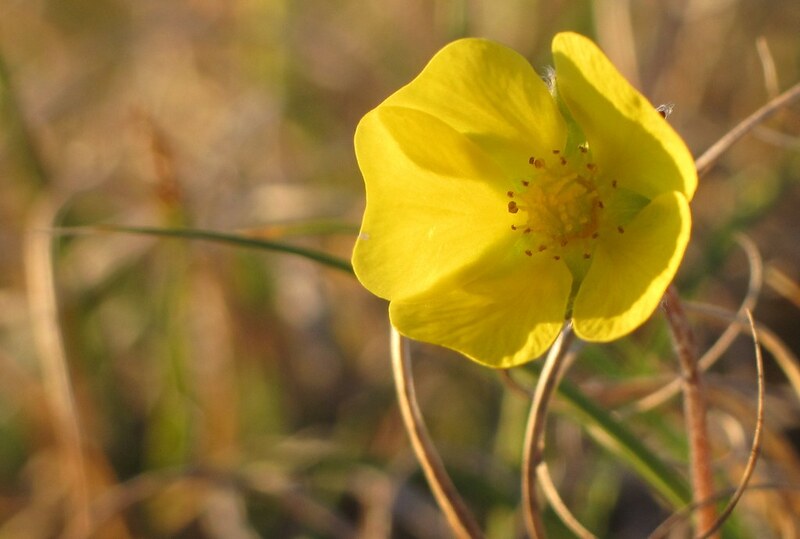 The site had an earlier than usual start to the season this year, so by the time we arrived, many of the flowers had finished blooming, and the season seemed well advanced. The lake still had a lot of ice on it as well, but all the ice disappeared while we were there. We stayed at “Hazen Camp” which is maintained by Parks Canada, and consists of a number of all-weather shelters for park staff. Visiting researchers set up tents in the camp area, and are also allowed to use the a kitchen shelter with a propane stove and a way to get out of the weather while we cooked. Several of the shelters date back to the 1950s and have been refurbished by the park. Some new sleeping shelters were actually constructed while we were there this summer. Access to the site is by Twin Otter out of Resolute Bay, and it is an incredible 3.5 hour or so flight to get there. The landing is a bit exciting, with a very bouncy runway. The terrain was generally very dry though, and was dominated by Dryas (white mountain avens) hummocks that were quite difficult to walk on. The area is quite mountainous, with ice caps and glaciers that feed streams that empty into the lake. Valleys in the mountains behind the camp are fed by melting permafrost in the active layer, and there were tundra ponds and sedge meadows in most nearby valleys. Our main sampling sites were set up in one of these valleys, called Skeleton Valley, in the hills behind camp. We didn’t venture too far from camp (only a few km) for our sampling, as we had to carry everything by foot, but the students enjoyed some of the spectacular hiking in the area. We were also able to tag along with a helicopter that was on site doing work for Parks Canada to get across the lake to sample the river and surrounding areas that flows out of Lake Hazen. After nearly two weeks of sampling, which included the aquatic sampling, the setting up and regular servicing of the pitfall, pan, and malaise traps, as well as extra pan trapping in multiple habitats and considerable opportunistic sampling with the sweep net, we had one of the nicest days of our time there to pack up our gear and wait for the plane to take us out. It was a bittersweet day; it was hard to leave such a gorgeous spot, but the team was pretty tired after their intensive summer, and anxious to get back home. Hazen was an amazing experience, and I’m glad I had the chance to work there. Now we have to buckle down and sort samples to find out what we found! The last few weeks in Kug were an exciting whirlwind of activity. Final trap collections were conducted and trapping equipment was removed and packed for the journey back home. 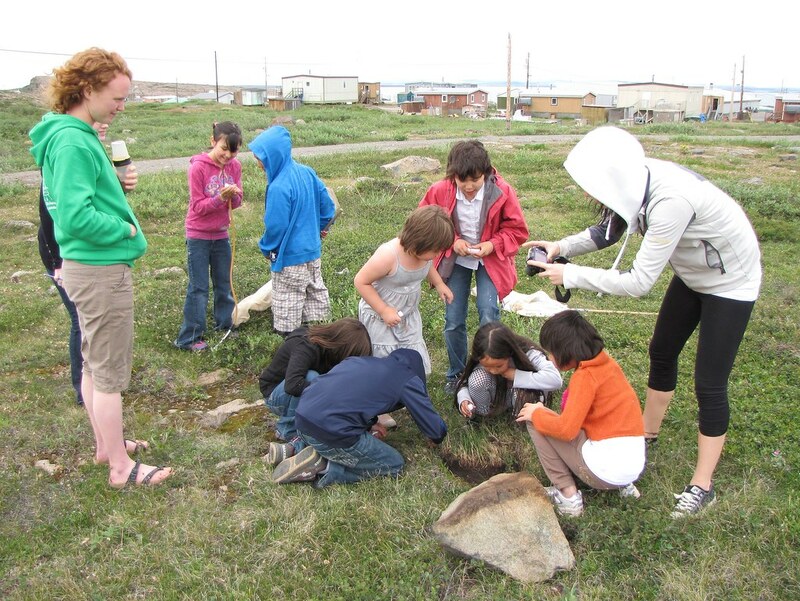 Amidst this work, some amazing things were happening with the youth of Kugluktuk; kids of all ages were getting excited about bugs and science! A great opportunity to work with Kug youth presented itself when leaders from a visiting Actua Science Camp allowed me to spend a day with their campers. We talked about the importance of insects in their community and then headed outside to see what kind of bugs we could find. The kids had a blast turning over rocks for spiders, trying out “real scientists’ ” equipment (sweep nets and aspirators), and gleefully tucking creepy-crawlies in their own vials. Classes at Kugluktuk High School resumed in August, providing me a chance to work with some older students. During the first week of school, students participate in week-long mini-courses on various subjects. I worked with two teachers to develop a course on northern insects and climate change. I gave a well-received talk and collection method demonstration for their very keen students, and then spent two days in the field with them. 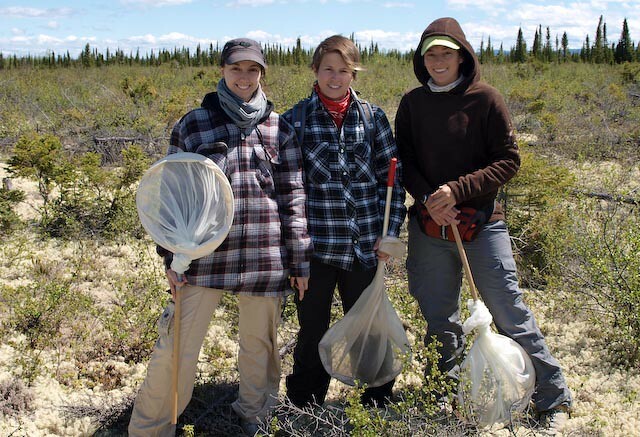 On the second day, the students’ newly acquired skills were put to the test: we travelled out on the land to one of my trapping sites, where they carefully gathered the contents of pan and pitfall traps, set up malaise traps, and practiced sweep-netting. These traps were left in place, and the students continue to collect their contents weekly – this will provide data for nearly an entire summer season in Kug! Since my departure, the high school students have visited the primary school to teach the younger students about their experiences. Students work together to collect a yellow pan sample. Last but not least, my stay in Kug coincided with the final leg of the journey undertaken by Canadian high school students aboard the CCGS Amundsen, the coast guard ship that hosted ArcticNet’s Schools on Board program. 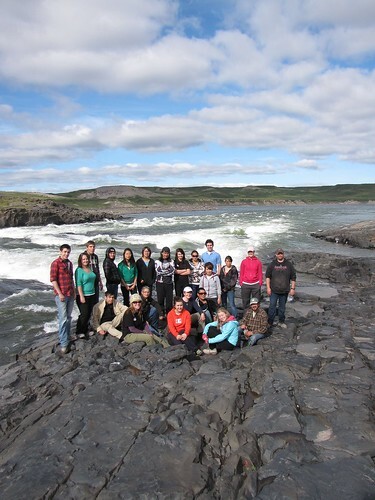 These students, who hailed from high schools across northern Canada, joined up with some of the local students and spent the day with me on the Coppermine River, sampling aquatic invertebrates in the rapids. It was a beautiful day, and we had great fun spooking ourselves with the large black and yellow stone flies hidden under rocks on the shore. Entomological field work at Lake Hazen was a success and the view at this arctic oasis was absolutely amazing! Despite some weather related travel delays (both on the way there and back), the trip went very smoothly. Aside from insect collection, some personal highlights of the trip were: arctic camping, hiking Mount McGill, and gazing….from a distance of course….at the magnificent musk oxen. Now that we are back in the lab processing samples, I cannot wait to see what we collected from this pristine environment. Our traveling teams have reached their final destinations. Moose is hard at work in Iqaluit and we’ve received word that Goose has landed in Lake Hazen. Both teams have let us know that things are going well, but they will also have extremely limited contact with us until they return south. They do have satellite phones, which will be used for daily check-ins, but details and photographs of their adventures will have to wait for a few weeks. Hi guys… still in Resolute, and possibly won’t get out tomorrow; they’re not sounding hopeful, but we’re still keeping our fingers crossed. We signed out a vehicle this afternoon, to take a look around (very very tiny place, and not much to see in town), and the Parks Canada archeologist came along to take us to a local Thule site; it was very neat. It is partially reconstructed, and she gave us a really nice background to it. One of the Parks guys did a project on Linyphiid spiders here many years back for Paul Hebert, and did a bunch of pitfall trapping. There is very little vegetation here, and it is sparse indeed. It is mostly gravel, and Andrew (our Parks guy that did the spider study many years back) says that all of Cornwallis Island is a big gravel pile. 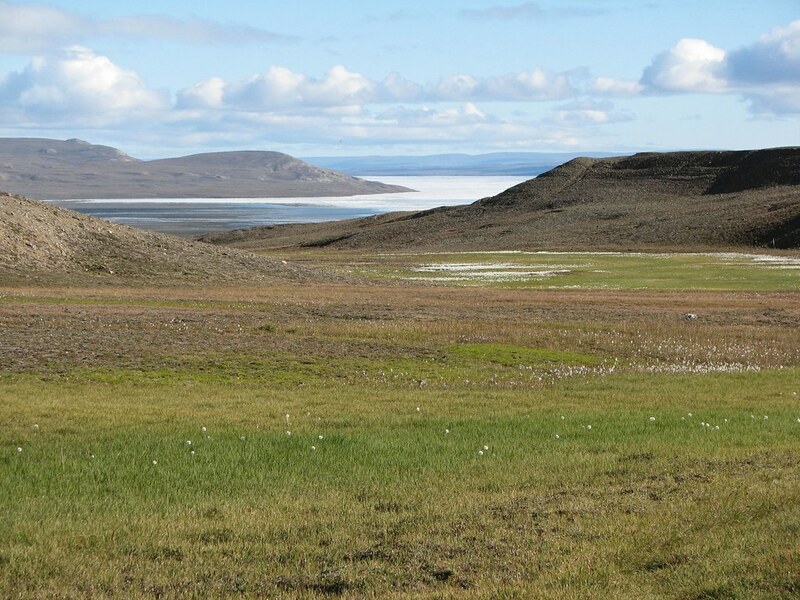 There are some scattered matts of low vegetation but with a lot of gravel in between, and he said that even the “lusher” sites aren’t very lush, at least compared to Ellesmere Island. We did see a fly (in the cold and wind and fog). So, we’re here for the night at least, and still hopeful for tomorrow. The P.M. is due here next week; hopefully we won’t still be here. We’re keeping our fingers crossed for you! 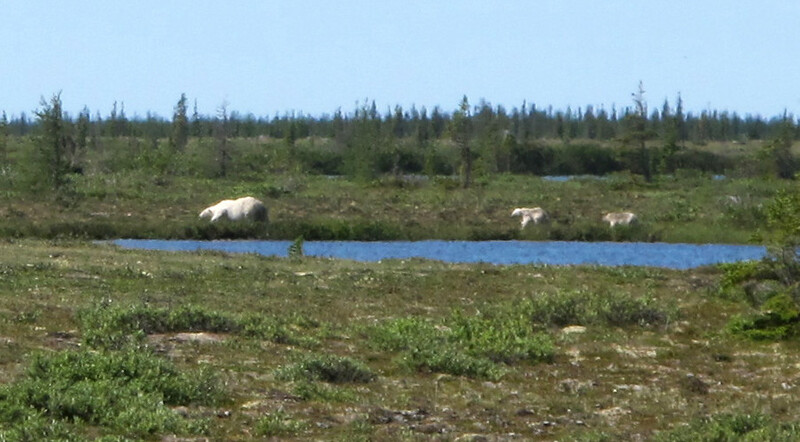 The NBP field season officially kicked off today with the departure of “Team Moose” and “Team Goose”! Team Goose (consisting of Sarah, Meagan and Christine), arrived safely in Goose Bay, Newfoundland earlier today. They will be joined by team leaders Donna and Chris in the next few days. This is the first of three stops for the team. 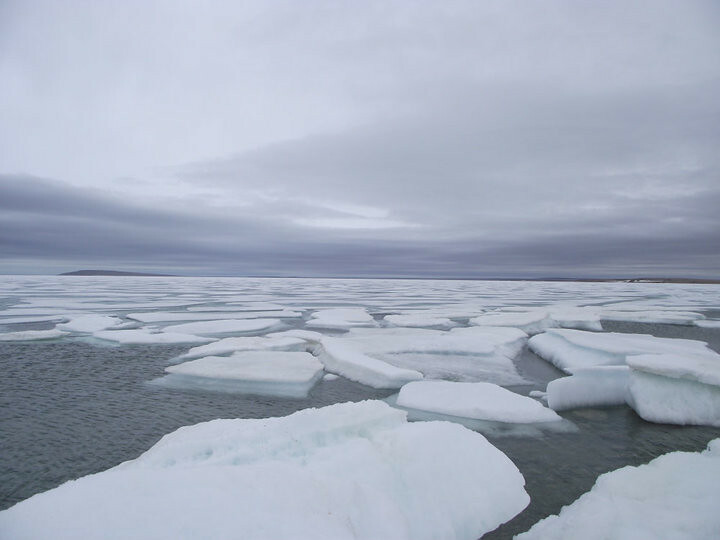 After Goose Bay, they travel northward to Schefferville, Quebec, and wrap up their journey with a two-week stop at Lake Hazen, Nunavut. All three locations will be intensively sampled, for both aquatic and terrestrial arthropods, for a two-week period. Our months of planning, preparation and training are finally being put to the test! (L-R) Sarah, Christine and Meagan are thrilled to start their journey! Team Moose (Patrick, Jana, Anna) and their team leader, Doug, will soon arrive in Moosonee, Ontario – the first leg of their journey. After two weeks of collecting, they will move on to Churchill, Manitoba, then Iqaluit, Nunavut. Hopefully we’ll get an update from them soon! The last member of the NBP team, Crystal, will be flying out to Kugluktuk, Nunavut, in a week’s time. 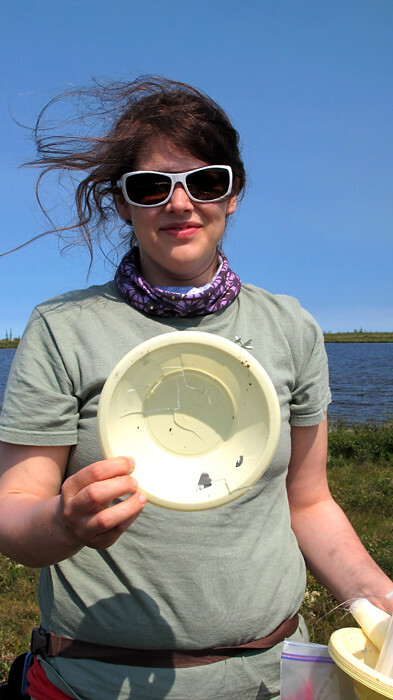 With the help of Angut Pedersen (a resident of Kugluktuk who has been attending school in Ontario), Crystal will be conducting the same intensive two-week sampling regime three times over the course of the summer along with her own experiments. She and Angut will also be working within the community to develop training opportunities for students, and to create a scientific collection of locally significant insects.NBP team members have an incredibly exciting summer ahead of them – this is surely a once-in-a-lifetime opportunity!